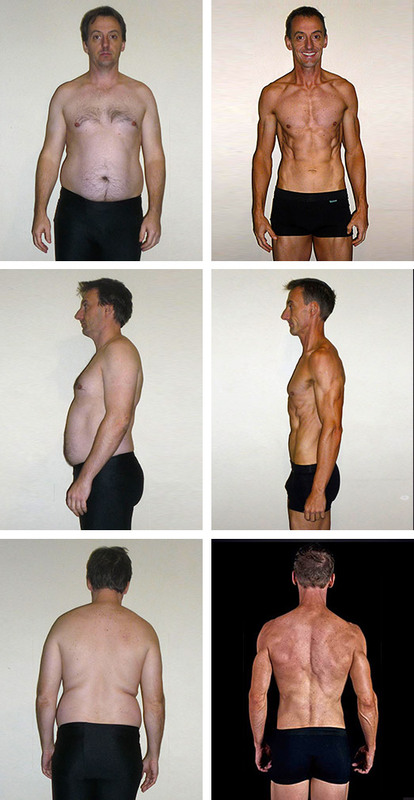 Kevin Littler joined Precision Nutrition Coaching to lose fat. And he did; an impressive 37 pounds. But what surprised him more were the inner changes: improved confidence, grace under pressure, and deeper self-awareness. He overcame breakups and emotional baggage, regained control, and lost fat in the bargain. This is one client’s story, in his own words. Lost 37 lbs and 12.8% body fat! Precision Nutrition is not a diet. Nor a set of prescribed exercises. Instead, it’s a uniquely powerful coaching program that helps clients lose fat, increase their fitness, improve their health. Many of our clients like to chronicle that change. So we give them space to write about their experiences on a members’ forum. Why? Because research shows that putting an experience into words can help us make sense of what’s going on in our heads. The stories we tell about ourselves can influence the way we see and shape our lives. Every now and then we come across a client journal that’s so profound, so insightful, or so funny and clever that we feel moved to share it. After all, stories do more than help us make sense of our own experiences. They can also inspire and motivate others. That’s why we thought it would be a great idea to publish some of our clients’ stories more widely . So you could hear them talk about their experience in their own words and their own voices. So, with their permission, we’ve decided to do just that, in an occasional series that will give you an inside scoop on what it’s like to participate in one of our coaching programs. Today, we feature PN Coaching finalist Kevin Littler. Kevin lives in Australia and works as a physiotherapist. And, like most people, he signed up hoping to lose a little extra weight. He did lose weight — almost forty pounds — and he shed it in the face of some significant emotional hurdles. Yet the program’s biggest benefit, as Kevin sees it, is the way it improved his inner fitness, giving him the strength to face the past and future alike with a clearer sense of purpose. Follow Kevin as he sums up a year of amazing learning and growth. 39 years of age. The fattest I’ve ever been. The most unfit I have ever been. And apart from a couple of single lifetime events, probably generally the unhappiest I have ever been. What brings an experienced health professional to PN Coaching? Down the road from my office I am eating a meat pie with a Coke for lunch. I feel lethargic, I feel slow. But most of all, I feel ashamed. As a physiotherapist, I am a health professional who gives other people exercises for a living. I used to be a triathlete who’d regularly go for 25 km runs. Now I can’t run 5 km without stopping to walk. And worst of all, I have just taken a part time job doing some lecturing to future personal trainers. What credibility do I have teaching exercise physiology when I get short of breath going up the one flight of steps to the lecture room? Looking at my pie, I get a sudden and overwhelming feeling like an epiphany that I have to do PN Coaching and I need to sign up right now… I cannot even wait until I am back in the office, so I pull out my phone and sign up for the pre-entry for the program right then and there, and put the date of official sign up in my diary. But… I still finish my pie and Coke. We start the coaching program. I take the official photos, plus some others for interest. I can’t look at them when I import them onto the computer. I get upset when I see on the screen just how far I have let myself go. Kevin, at the start of PN Coaching, July 2012. I begin taking lots of photos of my food, as I am amazed by all the colors of my new habits of shopping and prepping for the week. I begin my usual habit of going through two large bunches of spinach a week. The grocer recognizes me and heads out to the back to retrieve more spinach for me whenever I come in! Still have a long way to go, but I think I’m starting to look a bit healthier. I ask my partner of 4+ years, whom I’d hoped to be with forever, whether she would like to buy a house together, and whether she sees us having a family. One week later, I am moving my possessions from her house, and living alone, to give her “time to think about what she wants.” All my requests to clarify whether we’re still a couple go unanswered. I never hear from her again. I have always responded to grief by overeating, not exercising, and drinking alcohol. But this time is totally different. Despite being distraught, I stick to my PN habits, which give me a sense of routine and normality amongst the rocky emotional time. Around this time in the program, the emphasis shifts from nutrition lessons to life lessons, and for me, the shift couldn’t come at a better time. In response to my personal woes, I’m momentarily diverted from the PN exercise routine. I pull out my old triathlon bike. Cycling was an activity I shared with my ex-partner and was something that initially brought us together before I stopped and got fat. Hearing she has started training for a triathlon, and trying to find ways to feel connected with her, I decide that maybe a return to triathlon would be a good idea. But adding in a few swims to the weight-training program in less than a week gives me bursitis in both shoulders. I wake up one Saturday morning cannot even reach my mouth with either hand. I have to bend my head down just to brush my teeth. The result? Two months of heavily modified or non-existent weight training, with a lot of rehabilitation. Even so, I stick to the nutrition plan as best I can, and discuss my rehab and training modifications with my coach, Brian St. Pierre. Eventually, I realize the connection between my diversion from the training program and my sense of loss. I conclude that my heart’s not really in these endurance activities anymore. I feel better and look better with a more balanced routine of strength training plus a couple of cardio sessions. Entering PN Coaching, I expected to get fitter. I didn’t expect the level of introspection, self-examination, and personal development we would undergo. I knew I had some psychological and emotional blocks, but doesn’t everybody? It had always felt too difficult to address them, so I swept them under the carpet instead. But midway through the program, I decide that phase is over. It’s now or never. I need to do this work. Nearly six years ago, after a year of minimal exercise due to work and study commitments, I was making one of my occasional attempts to improve my fitness. One Sunday morning that included a 16 km run. At the end of that run, I didn’t feel too good. And within a few hours, I was feeling much, much worse. Because shortly after I returned, I learned that my younger sister, to whom I was close, had taken her own life. The loss of my sister left me in a very dark place that I didn’t emerge from for many months. And ever since, every time I tried to run more than 16 km, I would mysteriously get injured or sick. Achilles tendonosis, ITB friction syndrome, colds and flu – they’d attack me out of the blue, just as I came close to that distance. Now I see this for what it is: a form of mental self-sabotage based on survivor’s guilt. I decide that this week, I will take control and exceed the distance barrier in my head. I am staying at my Mum’s for the weekend — very close to where my sister lived and where we grew up together. Somehow, this feels right. 6 am Sunday morning, before the rest of the family are stirring, I put on my running gear and head out into the darkness, a GPS watch strapped to my wrist to let me know exactly how far I have gone. Without planning it, I tick over the 16 km mark less than 20 m away from the turn-off to the street where my sister last lived. I pause momentarily, tell my sister I love her… and keep moving. I call into the corner shop on the way home to pick up some milk. It’s fifteen minutes before closing and the shop assistant asks if I want a meat pie for free, as they’ve turned the warmer off for the night. “No,” I say — without a second’s hesitation. Not until I’m in the car do I realize the irony. I’ve just refused free food because it’s something I don’t put in my body anymore. But it was eating a meat pie eleven months earlier that made me sign up for the program in the first place! Wow, have I really lost that much? Kevin, 10 months in to PN Coaching, can’t believe how much he’s lost. Finally, after ten months of self-examination, grief, loss, and eventual reinvention, I prepare for some fun in the final photo shoot. Not that I usually like being the center of attention. But somehow, this feels different. Photos complete, I recognize that for the first time in a long time, I am content — even happy. I have moved through the dark places. I am basking in the sunshine. While I’m pleased with my physical changes, I’m proudest of the changes you can’t see. Entry #12: What is PN Coaching really about? For me, the program isn’t really about fat loss, in the end. It’s about the type of person I have had to become to achieve that transformation. Principles and integrity: It’s about developing the character required to achieve that success. Self-talk and grit: It’s about creating dominant thoughts that are positive and constructive, and developing courage and persistence. Equanimity: It’s about accepting things for what they are; not seeing things that go wrong as failures and viewing them instead as experience and feedback. Taking responsibility: It’s about seeing that I can either create my life or have others create it for me. Connecting and reaching out: It’s about recognizing the importance of a support network, and surrounding myself with positive, supportive, encouraging people. Acting, consistently: It’s about realizing that no matter how smart I am and how much I know about exercise, if I’m not living it, I don’t really know it. Faith: It’s about believing I am worthy of success. It’s about trusting that the roadblocks along the way exist to show me the true path I should be taking. Taking initiative: It’s understanding that fear goes away only after I act on something, and that waiting for fear to cease will keep me stagnant. Insight: It’s about becoming more self-aware — knowing what I want, aligning my priorities with that vision, and having the courage to ask for things that will help me meet these priorities — as well as the courage to reject things that don’t. Giving back: And, increasingly, it’s about paying it forward, seeing to the needs of others. My greatest sense of achievement comes from building their self-esteem, and motivating them to take risks and move forward. Through helping others grow and develop, I receive more than I could ever give. That’s why we work closely with Precision Nutrition Coaching clients to help them lose fat, get stronger, and improve their health…no matter what challenges they’re dealing with. It’s also why we work with health and fitness pros (through our Level 1 and Level 2 Certification programs) to teach them how to coach their own clients through the same challenges.